To understand the difference between the two methods, read Subscription Renewal Process before continuing. This guide provides a detailed and up-to-date list of the gateway extensions that support one or both payment methods. For extensions that support automatic payments, it also provides information about supported subscription-specific features. The following payment gateway extensions support automatic recurring payments and are part of the official WooCommerce marketplace. This means they are backed by WooCommerce.com support and customer service. Different payment gateways offer different features. The tables outline which Subscriptions features are supported by each WooCommerce payment gateway, with an explanation of each feature found below the table. Using an extension purchased or downloaded from a vendor other than WooCommerce.com. Accessing one of these gateways through a third party hosted checkout system. Integrating a gateway with another unless that payment gateway is also mentioned above. For example, customers can purchase subscriptions and have future automatic recurring payments processed with PayPal via the Braintree WooCommerce extension, which is why there is a row in the table above for Braintree (PayPal). However, other payment gateways that also offer PayPal payments cannot be used to create subscriptions with automatic payments via PayPal. Click the name of the extension in the table. This takes you to the product page at WooCommerce.com. Find Changelog on the page. Click the link, and compare your version to the current one. Subscription Suspension, Cancellation or Reactivation: A store manager or customer can change the status of a subscription directly from your store, i.e., without visiting the payment gateway. Multiple Subscriptions: A customer can add different subscription products to their cart and complete checkout. More info at: Guide to Multiple Subscriptions. Modifications: Recurring Total: You as store manager can manually change the recurring amount charged for renewal payments. Modifications: Payment Date: You as store manager can manually change the payment schedule for a subscription, including the expiration date, trial length or next payment date. Payment Method Changes: Customer: Payment gateway is presented as an option when a customer changes the recurring payment method used for a subscription. It also means Subscriptions can update the payment method used for future recurring payments when a customer pays for a failed renewal. Payment Method Changes: Administrator: Payment gateway is presented to the store manager as an option when changing the recurring payment method used for a subscription on the Edit Subscription screen. Although PayPal Standard is included free with Subscriptions, it is also one of the most limited payment gateways. Controlling the schedule for charging recurring payments and batch processes payments, so payments are not processed exactly when due. Instead, PayPal processes a payment within 24 hours of due date. For example, if a recurring payment is due at 2pm on 1st July, PayPal may charge that payment anytime between 12:00am and 11:59pm on the 1st of July. Depending on your timezone, this may cause payments to be processed on a different day than customer signup. If a payment is held at PayPal because it is in a currency not supported by the merchant’s PayPal account, when that payment is accepted at PayPal.com, PayPal does not send an IPN message to notify WooCommerce or Subscriptions that the payment has been completed. That means there is no way to automatically update the order’s status for the transaction. The order’s status needs to be manually updated in WooCommerce. Not supporting subscriptions with a $0 recurring total (i.e. subscriptions where the total cost is charged up front, but an item is still shipped on a regular basis. WooCommerce Subscriptions does work around this limitation by sending the initial purchase to PayPal as a one-off purchase and then processing the renewals itself; however, subscriptions with a $0 total won’t show up in your PayPal account like other subscriptions. Not supporting sign-up fees. WooCommerce Subscriptions will work around this limitation by splitting the payment if it includes a sign-up fee. It can then add any initial amount to an initial billing period, which PayPal (unfortunately) refers to as a Trial Period, and then set the correct recurring amount for all future payments. The initial and recurring totals add up correctly, and the billing schedule is the same as agreed on your site; but it may be confusing to your customers if they review a subscription’s details in their PayPal account and see Trial Period listed on a subscription with no mention of a trial period in your store. Not supporting subscriptions with a $0.01 recurring total. To record the second trial period (see above), PayPal sends a payment IPN for $0.01. This IPN should be ignored however it appears exactly the same as a standard renewal payment. For this reason, WooCommerce Subscriptions will ignore IPNs for $0.01. 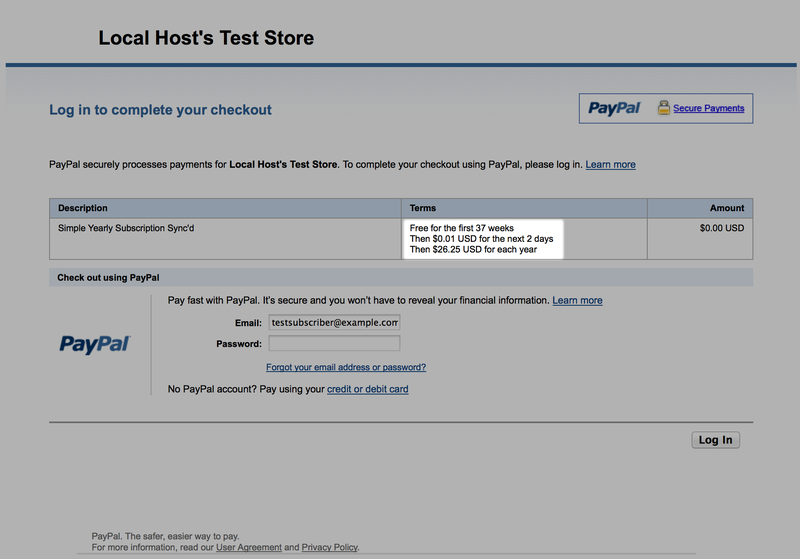 If you want to test PayPal Standard, please use a product with a recurring total greater than $0.01. Requiring subscribers to have a PayPal account for automatic recurring payments, unless you have registered for Enhanced Recurring Payments (and PayPal only offers Enhanced Recurring Payments to US companies). All WooCommerce payment methods and gateway extensions can be used to process manual subscription payments. Subscriptions creates a pending order for the renewal, then that order can be paid with any gateway with a working WooCommerce extension. When using a manual payment for a subscription, all features included in the table above are supported. Meaning the subscription can be suspended, canceled and reactivated. It can also have its recurring amount, next payment date and billing schedule changed. The renewal method applied to a subscription at the time of purchase is always applied to the subscription. So if the payment method used to purchase a subscription could only process manual renewal payments at time of purchase, the subscription continues with manual renewal payments even if the payment gateway extension adds support for automatic recurring payments. The following payment gateway extensions support automatic subscription payments and are developed by third-party developers. Because they are not sold or supported by WooCommerce.com, you need to contact the extension authors with questions. If there is another gateway you want to use to sell subscriptions and charge automatic payments, contact the developer of the WooCommerce extension for that gateway to request they add support for WooCommerce Subscriptions. If you are a developer and want to add support for automatic subscription payments to your gateway, see the Subscriptions Payment Gateway Integration Guide. Want a different payment gateway?